There is a certain reputation that insurance companies carry around with them—and it’s not exactly a good one. Time after time you hear stories of major insurance companies breaking the trust of their clients by catching them in loopholes, hiding game-changing information in the fine print, or writing policies in way that is deliberately vague and difficult to interpret. Whether this behaviour is deliberate or not, for the people depending on their services, this can be devastating. This was the case recently for Robert Booth. According to CBC, Booth purchased a used truck in rough shape for $5,000, but after pouring time, money and energy into restoring and modifying it, he sought an auto insurance plan that would cover the truck for its current value, not its original sticker price. 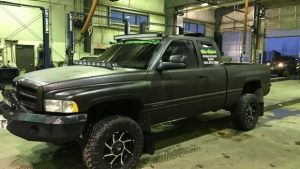 Booth told CBC that the truck was “95 per cent restored or rebuilt,” and after all work was completed, was appraised at over $40,000. Booth proceeded in a responsible manner—or so he thought. He signed a new policy with a major insurance provider, The Co-operators (see insurance reviews for The Co-operators here) that accepted $40,900 as the recorded purchases price, and stated he would be covered for $43,000 in the case of total loss. Like Booth, most consumers wouldn’t bat an eye at this point. Most would look at that paperwork and feel confident that they were adequately covered, especially since it was big-name company. But unfortunately, a big name doesn’t equal greater accountability. When Booth found himself in a dire situation and in need of coverage—his truck was stolen and burned—that big name didn’t come through the way he had expected. They offered him only $5,500, explaining that his policy covered him for the lesser of appraised value or the cash value of the vehicle. By categorizing the vehicle’s upgrades as “necessary maintenance,” they were able to ignore those costs and values and consider only the original sticker price of the vehicle. Though the insurance company was technically following their known policy, this type of behaviour is still problematic for consumers. Not only was the policy unclear to Booth, he also couldn’t have known that they would look at upgrades and customization as necessary maintenance, thereby swinging the case in their own favour. Insurance policies tend not to be written in ways that are easy to understand, and insurance companies don’t always go out of their way to make sure their clients are in full understanding of what they’re signing up for. This is why it’s important to go in armed with knowledge. The two most important things you can do before signing an insurance policy are familiarizing yourself with the company and their customer service history, and asking detailed questions. By familiarizing yourself with the company and reading consumer reviews, you’ll be going in with an idea of what to expect, where the company excels, and where they tend not to explain things thoroughly enough. By doing a little research, you may even get a recommendation for a particular agent who is helpful and thorough. One you’re armed with enough information to choose an insurance company and have set up an appointment with them, it’s time to ask questions. Read the fine print before signing anything and if you don’t understand what it means, ask! Ask what the conditions are on each part of the policy, and ask them to explain with examples so that you fully understand what you’re signing up for. Fortunately, there is someone who can cut through the fine print and help you get to the truth. InsurEye is a hub for all of your insurance questions and concerns. Head to the InsurEye website to gather and compare quotes, find out what other consumers are paying, read tips and advice on navigating your policy, and read insurance company reviews from the people you can trust most: other consumers. Connecting with others in similar situations will help you to choose the best insurance company and policy, and avoid tricky situations. There is advice available on all the major categories of insurance, including, life, vehicle, so you’ll be informed and prepared for anything. Read a full story at CBC News Edmonton. One Calgary man’s insurance claim has left him fighting for his payout. Tyler Tailby was parked in a stall next to the Calgary Catholic School District (CCSD) building, which also houses a dental office, medical clinic, and chiropractic office, for an appointment this past February when disaster struck. Ice fell off the downtown building’s roof, smashing the hood and fender of his vehicle. 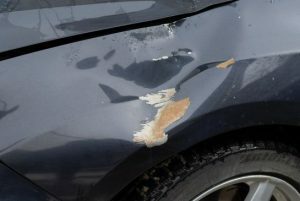 Tailby noticed the damage when he returned to his car, but despite reporting it to the building manager, who had photos taken of the damage, he has yet to receive any form of compensation for the damages—and according to the insurance company, he isn’t likely to see any at all. When Tailby contacted the insurance company for the CCSD, Traveler’s Insurance, he was told it was an “act of God” when the ice fell. He was also informed that it would be “very unlikely” that they would be able to prove that CCSD had been negligent or was in any other way at fault in the incident. Tailby says he was warned about the potential for falling ice by reception at his chiropractor’s office and was advised to park further away, but there were no signs advertising the risk near where he parked. The damages to Tailby’s car have been estimated at around $2,500 since both the hood and fender will have to be replaced. CCSD continues to deny negligence. A spokesperson informed Tailby that the dome-shaped building prevents roof access, so they are unable to clean excess snow and ice buildup off their roof to prevent its falling. They have since had new signs made up to warn of the risk of falling ice. But according to Tailby, the CCSD should pay: “They should step up and pay for this. It was dangerous ice from their property,” he quotes. Taliby’ auto insurance company Wawanesa (see insurance reviews for Wawanesa here) didn’t comment on this case. Accidents like this one aren’t uncommon, but how can you protect yourself from seemingly random accidents where no one (but God) can truly be deemed at fault? Even though the ice falling may be considered an “act of God” by the CCSD, Tailby may still have a case against the insurance company involved. The grey area lies in the event’s preventability. Ice falling may be considered an “act of God,” but Tailby is arguing that human interference could have prevented the ice from damaging his car—like clearing the roof or posting proper signage prior to the accident—and that is a valid claim, although proving that form of negligence may still present its challenges. Are you aware of any other media stories that did not make into this issue of Top Media Stories about Car Insurance in Alberta? Let us know via your comment below. Are you currently in this province and look for a cheap car insurance in Alberta? We can help!